Whilst shopping at Coastal feed store in Mount Vernon a few weeks ago, when I spoiled us with some new tack for Sunshine, I spotted a box of lip balm at the till. I was really just intrigued by the name. I did my best not to think too hard about how that works, and added a tube to our pile of leather and metal on the desk. I then forgot all about it for several days. I eventually remembered, and dug it out to see what on earth I had bought. Look at this lovely list of ingredients! 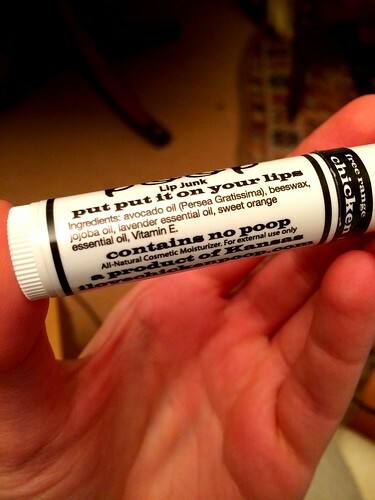 No poop! Yay! I slathered it on immediately. The flavour is citrusy and fresh, but leaves a soft and buttery feel on the lips. The consistency is just right – not too firm, not too squishy. I am rapidly wishing I had picked up a fistful of these. If you see some Chicken Poop on your shopping travels, invest. You won’t regret it. P.S. 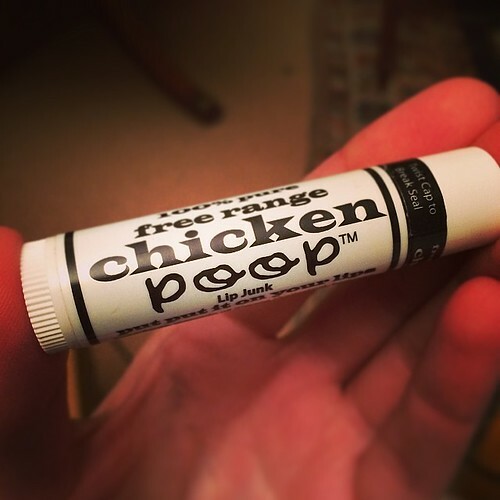 It turns out the “remedy” was that if you put chicken poop on your lips, you wouldn’t lick them any longer, thus ending the vicious cycle of chapped lips. Still disgusting. Visit the website to see other lovely looking products, such as Good Gravey, and Kill It Dead. I’ll take them just for the names and scrumptious packaging. ← "She’s not doing well."